Early Adopter Alun – Talented Guitarist and Singer! Alun McCarthy, one of the first Power Music users, is a talented worship leader, guitarist and singer. Alun is one of the most enthusiastic and encouraging Power Music users we have. We meet up with him every year at the Mission Worship Conference in Eastbourne in November. He will be inteviewed at the seminar “Going Digital” (presented by our own Gordon Cameron) at this year’s Mission Worship. I play guitar and have a small collection but my instrument of choice is my trusty Epiphone 12 string – a beautiful guitar with a wonderful voice and a gentle action which lends itself to a wide variety of styles of worship. I learned to play at a Youth Club I went to when I was in my early teens, finding out how to get my hands round the fretboard mainly through a diet of rock and folk songs. Looking back I think this was ideal because it taught me to appreciate and play a wide variety of styles and to build up a good basic knowledge of chords and harmonics and I put this into practice almost every time I lead worship now. 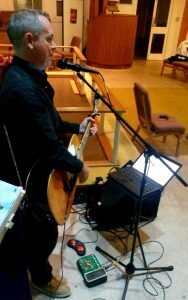 I’ve been a lead worshipper at St Peter’s Shared Church in Guildford for 11 years and I’m equally at home heading up a Worship Team or leading sung worship solo. I was “encouraged” to join my Church Worship Team by the leader of our small study group, who spotted my guitar in the corner of our living room one evening. After being uncertain at first I quickly felt this was like a calling for me. I started out as a musician only, but I was encouraged by the leader of another local church who took me under their wing and really helped me to develop my skills and bring my voice out. It’s only by looking back now that I’ve been able to realise so many other people saw a potential in me that is now being fulfilled. I hooked up with the Power Music Team in 2007, when version 1 of the product was still in its infancy. I really can’t think of another company or organisation that treats their customers as well as Brenda, Gordon & Co do. The support and assistance they give is second to none and every time I use Power Music I thank them for easing the burden on my arms! 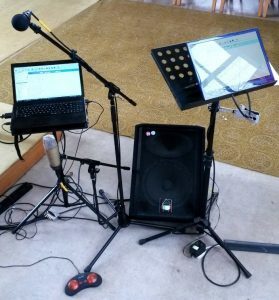 My basic set-up is running Power Music Professional on a laptop, with a repeat monitor set up for our bassist or backing singers. I use a BiLiPro page turner which really helps keep the flow of worship steady. I’m looking to change the pedal to a bluetooth version shortly. 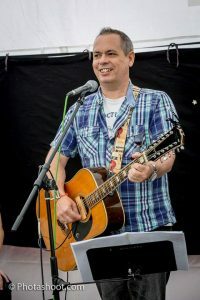 I was recently asked to play a local music festival, my first “non-church” gig since leaving school (which is way too long ago to even think about!) I found Power Music was excellent for the band’s practice times because I set up the chord charts and ran my laptop through a wall-mounted tv at home. I think it’s often good to be dynamic in worship – including songs at a moment’s notice and searching out references from a sermon if a relevant song springs to mind. I lead on a Saturday evening service and I regularly leave a space in the set-list for moments of spontaneous worship. Power Music helps me achieve this without the distraction of rustling the pages of various and ever-increasing volumes of music books. It’s this adaptability that is one of the most exciting features of the software for me, although this really only scratches the surface of what it is capable of. Pure worship comes from the heart, but so many times in the Old Testament we’re told that we should prepare, practice and hone our skills in worship. I firmly believe that we can use technology to help ease that process and make our heads meet our hearts, which in turn helps worship teams connect with congregations as we worship together.